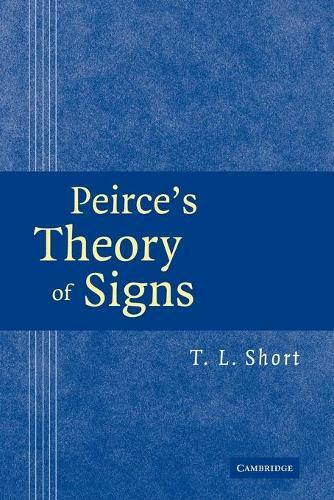 In this book, T. L. Short corrects widespread misconceptions of Peirce's theory of signs and demonstrates its relevance to contemporary analytic philosophy of language, mind and science. Peirce's theory of mind, naturalistic but nonreductive, bears on debates of Fodor and Millikan, among others. His theory of inquiry avoids foundationalism and subjectivism, while his account of reference anticipated views of Kripke and Putnam. Peirce's realism falls between 'internal' and 'metaphysical' realism and is more satisfactory than either. His pragmatism is not verificationism; rather, it identifies meaning with potential growth of knowledge. Short distinguishes Peirce's mature theory of signs from his better-known but paradoxical early theory. He develops the mature theory systematically on the basis of Peirce's phenomenological categories and concept of final causation. The latter is distinguished from recent and similar views, such as Brandon's, and is shown to be grounded in forms of explanation adopted in modern science.